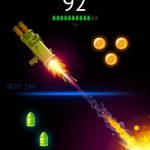 French casual gaming giant Ketchapp claims that double gun means double fun. So get your guns ready because the company’s new game is out for Android and iOS platforms. The mechanics of Double Guns is simple: players use two guns to shoot at different objects and break them apart. There are several types of available weapons – different types of guns, bows and arrows, – as well as a wide variety of objects to shoot at. Earn coins in the slot machine to unlock new weapons and items and master your shooting skills to become the best shooter! 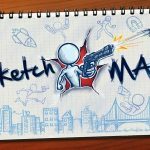 Grab your weapons and let’s get the shooting party started in Ketchapp’s new game! Read on for our collection of Double Guns cheats, tips and tricks! You can use one or both guns to shoot at the flying object. If you want to use the right gun, tap on the right side of your screen. Similarly, tap on the left side if you want to use the left gun. 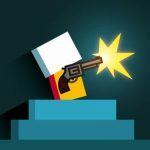 As you progress through the game and get to the more difficult levels, you will need to use both guns if you want to keep the flying object on the screen while you are firing at it. Otherwise, you die. You can start the more difficult levels by tapping both the right and the left sides simultaneously. 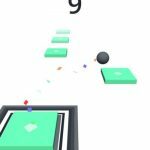 However, if you see that the flying object begins to drift to the left, tap only on the left side. And the same goes for the right side. It is extremely important to be able to find the right balance and keep your target on the screen. Coins are very important in Double Guns because they can be used to spin for practically everything. If you gather 250 coins, you will get a free spin that will allow you to unlock new weapons: new guns, new bows, or a new crossbow. Though their performance and damage will practically be the same, their appearance will be different. There are two ways you can earn coins in Double Guns. When you complete a level, you will get the chance to spin for coins. However, the amount you will earn depends solely on your luck. So, if you need coins but you have no luck, you can always visit the gun store and press the video button to watch a video ad. For each video that you watch you will receive 35 coins. And the best part is that video ads are always available if you have an Internet connection. The guys at Ketchapp are continuously updating Double Guns. So make sure to keep an eye on the items and weapons that get added. SMG might become available soon and it will include automatic fire. And this is where our tips and cheats guide for Double Guns ends. If you know more tips and cheats we could all benefit from, drop us a line. We would love to hear about them!